You can see here gallery of black and white and color digital pictures taken by Ryszard Lebmor. Photos of Cathedral Notre Dame, Eiffel Tower, Basilica of the Sacre Coeur, La Defense (modern city), Louvre. Paris is one of the world's wonders. Conquered in 52 BC by the Romans, it has been just a small fishing village on the island in the middle of the river Seine. The tribe living there has been called Parisians, but the Romans gave the village a new name - Lutetia (French: Lutèce). 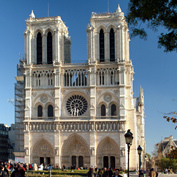 And it is the Romans, who built the village into the big and important city, expanding it to the banks of the Seine, far beyond the island - Ile de la Cité, where the Notre Dame Cathedral stands today. At the end of the Roman occupation around 5th century, the city returned to its original name - Paris and in 508 became the capital of the state of Franks. 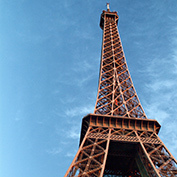 Since then, century after century, epoch after epoch, Paris grew in importance. In the 12th century king of France Philip II Augustus, built the new wall around the city, with sixty defensive towers. 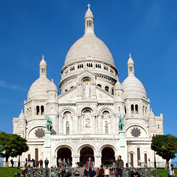 Paris has been then an important religious centre, and because of its university (Sorbonne), an important centre of science and culture for the whole Western Europe. At the same time, the city has been busy with crafts, trade and fashion. The role of Paris as an artistic and cultural centre grew with growing importance of France as the most powerful state on the European continent in the 16th and 17th centuries, especially under the reign of the Louis XIV. French revolution and the rule of the Napoleon I Bonaparte made Paris the centre of Europe in every aspect. Throughout the whole 19th century, Paris retained the leading role, as the centre of culture and sconce. Revolutionary Paris of the early 19th century has been one of the causes of its total reconstruction after 1848. A little has been left from the medieval town. A vast and audacious reconstruction of the whole city led by Baron Haussmann, prefect of Paris under Napoleon III, created the grands boulevards and the consequent star like plan of the city. The 12 big avenues led from the round square called Star (L'Etoile) created around the Arch of Triumph, and several more round squares interconnected in the completely new street plan. The world wars of the 20th century spared Paris. Its new quarter - La Defense (district info and history), visually matches the glorious architecture of the past Today, the greater Paris has almost 10 million inhabitants and because of its leading role in art, fashion and design is viewed by many people as the cultural capital of the world. 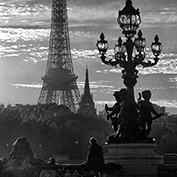 For a photographer, Paris offers the wealth of opportunities. Here is the city of grandeur and deep perspective. 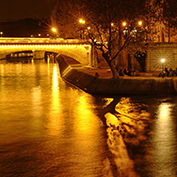 Built on several hills with the river Seine curving across, Paris offers so many striking views. Its life, busy and rich in events does not stop at any time of the day. Paris is often called the City of Light' ('La Ville Lumière), For a photographer this 19th century name given to Paris after it got its first street gas lanterns, is still a good description of this beautiful city. During the day, a pleasant, gentle Paris climate shows its landmark buildings in a constantly changing, new light. At night, all the important Paris monuments are superbly illuminated. Lights of the traffic and the nightlife of the city, complete the scene. Because in Paris, a photographer never sleeps.